You read it right! Clothes buffet it is! Imagine yourself entering a buffet place like the eat all you can restaurants but instead of seeing tables of food served, you will be seeing racks and racks of clothes. Does it not sounds more mouthwatering compared to seeing delicious food served? 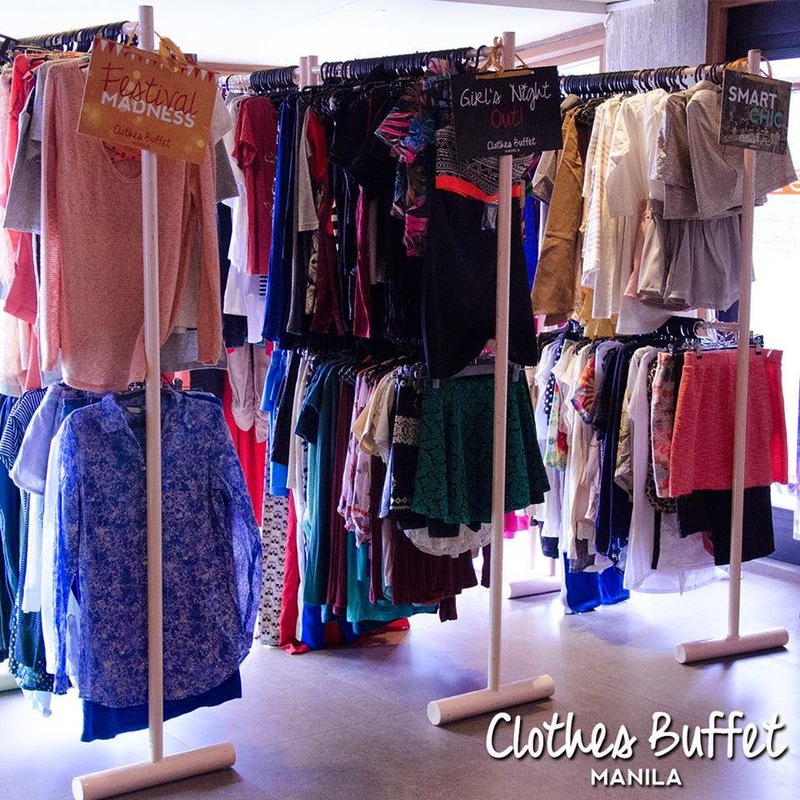 The Clothes Buffet will be launched in Manila to make shopping enjoyable and more exciting for all women. All clothes offered are brand new. This is their first season of having the creative way of shopping for ladies. It is an experience you will never forget. A great way to bond with your family, sisters, friends and whoever you want to go with. Whether you are a brand conscious or not this is a great shopping spree because all the clothes are known brands that will be up for grabs. You have more than 30,000 pieces of clothes to choose from. The clothes are divided into racks and by categories. The categories are Smart Chic, Girl's Night Out and Festival Madness. 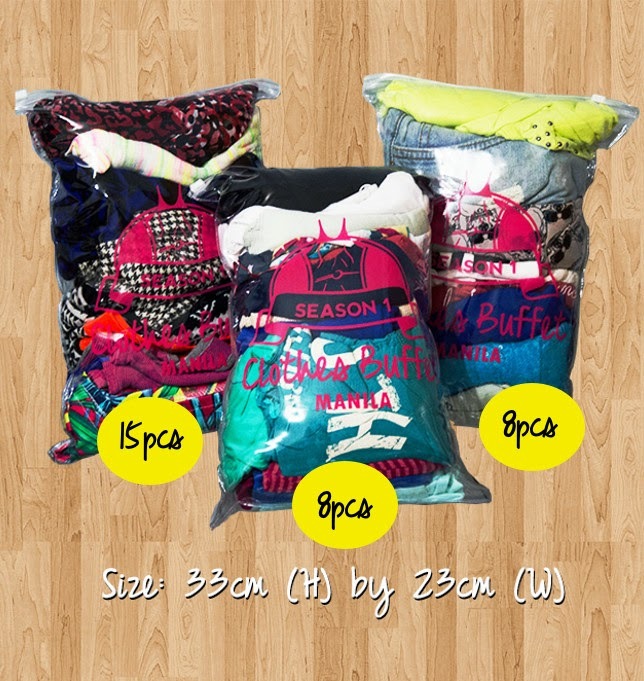 The sizes offered are Small, Medium and Large but limited and may vary. Men can also join and enjoy the event provided they also buy their own ticket but take note that there are no men's apparel available. Kids are not allowed inside the buffet area unless they have their own shopping bag. NOTE: Only women's apparel is being sold. Pick It - Zip It - Keep It! Pick the clothes you want, zip it inside the buffet bag and keep all of the fitted clothes inside your bag. So memorize this, Pick It - Zip It - Keep It. Repeat it and learn it by heart. 1. Book ahead and buy a ticket at http://www.clothesbuffetmanila.com/. Limited slots are offered per wave. Only 60 slots per wave. You can buy more than one tickets, there are no limit as long there are slots. Payment methods offered are Paypal, Credit Cards, Bank Transfers and Over the counter payments. Tickets will be sent via e-mail. 2. Arrive early at least 30 minutes before to register and deposit your bag to the first floor of Il Terrazzo. 3. One ticket is equivalent to one buffet bag the size of 33cm by 23cm of ziplock. Each wave is 15 minutes long. 4. After the buffet, all the clothes you got will be validated. 1. Get fit and ready because you have to shop and find what you want within 15 minutes. 2. Remember to handle your ziplock with care, all clothes will only be considered yours if you managed to put everything inside and sealing it neatly with no tears on your buffet bag. There is a 100php penalty if you ruin the buffet bag. 3. Learn to fold so you can fit everything inside your bag. 4. Know your size so you will be able to choose correctly. 5. Bring extra cash as there will be a mini bazaar too. Accessories and other stuff will be available. 6. DEFEAT the record of 15 clothes inside one buffet bag. It's food at presen and even before and now clothes for buffet, what a concept! Wow, this is really interesting. It would be great though if they can announce ahead of time which brands will be sold. It makes me hesitant too if my money is worth the brands of the clothes but this is a great way to bond with family and friends. This is so interesting. The venue is not far too. I hope they`ll have more slots by the time I have money. I don`t have much clothes to wear anymore since I don`t wear uniform at school. This is great because you can have many clothes for only Php 1,999 compared to buying clothes separately. How will I know if there are still open slots? 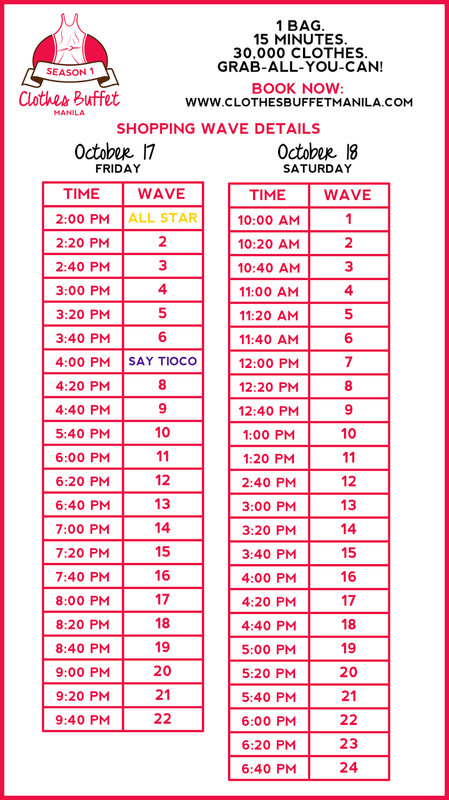 You can go to their website, they update the slots open for each wave. Thanks, @Christine Fernandez . I will.